Earlier this year, I started to track financial institutions on several popular social media sites. I hope you are already familiar with my Visible Banking Twitter Watch Series (#13 updates so far). 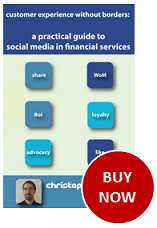 I decided to launch three additional Visible Banking Social Media Watch Series: YouTube, Facebook and Blogs. They are coming soon, stay tuned! 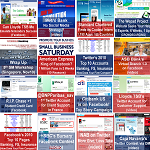 Today, I am tracking 1,293 blogs, twitter accounts, YouTube channels and Facebook pages/groups/apps from financial services firms (banks, central banks, credit unions, insurance companies, credit card issuers, tax and mortgage specialists) in 38 countries. I invite you to subscribe to Visible-Banking.com to check my regular updates which includes not only the most up-to-date stats but also some exclusive insights and my comments. You can find more regular updates on twitter: I usually use #VBTW for Twitter, #VBBW for blogs, #VBFW for Facebook, #VBYW for YouTube.